Contributors to the anthology Still Coming Home: Denver Veterans Writing, published by Colorado Humanities in 2018, will read at the Rocky Mountain Regional VA Medical Center, Auditorium, 1700 North Wheeling Street, Aurora, 80045 on Saturday, April 20 from 2:00 to 4:00 p.m. Denver Veterans Writing Workshop leaders selected the pieces to include in the anthology and worked with the authors to prepare their work for publication. As the editors write in the Introduction, “What you will see here are essays, stories, and poems that are as complicated and diverse as the individuals who make up the military. But what they all have in common is a sincere effort to tell their stories in the most vulnerable and honest way that they could.” Readers include Maryanna W. Brunkhorst, Carol Covington, Luke Anthony Alfonso Martínez, and Michael McAndrew. 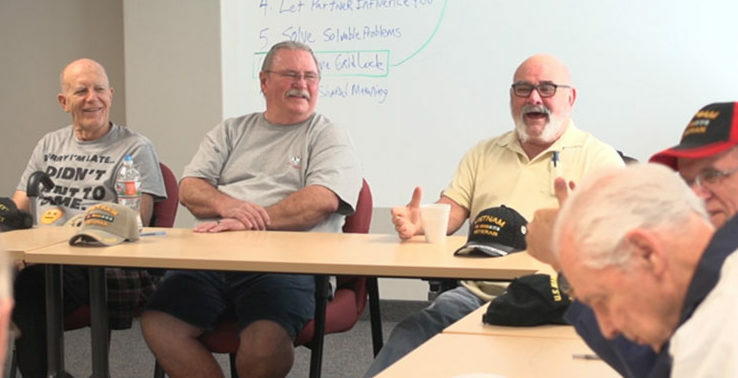 The VA Eastern Colorado Health Care System is proud to provide a space and a platform for Veterans to tell their remarkable stories. Under the leadership of former Chairman William Adams, a Vietnam veteran and a philosophy scholar, the National Endowment for the Humanities issued a call to the state humanities councils “to explore the experience of war through the lens of the humanities” through an initiative called “Standing Together.” These ideas and aspirations came together as Colorado Humanities was awarded an Arts in Society grant, funded by Bonfils-Stanton Foundation, Colorado Creative Industries, and Hemera Foundation, and in partnership with RedLine Contemporary Art Center through their Arts in Society Program.